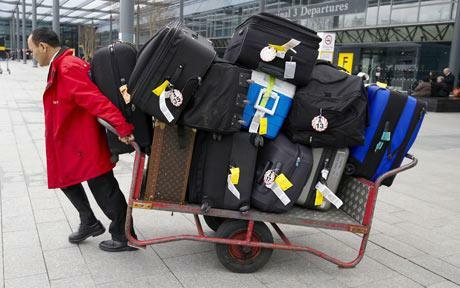 Madonna flew into Heathrow with a couple of bags today…..The Telegraph shows her 25 pieces of luggage being hauled by a porter across Terminal 3. One is that she was sensibly not flying with British Airways, otherwise she would have been in Terminal 5, and the other is that she was not using the services of one of the cheaper airlines. Notwithstanding my great love of Michael O’Leary I did fall foul of the cabin baggage allowance on a Ryanair flight the other day, meaning an add-on of 35 euros…..
Then I flew a week later with BMI baby from Cardiff to Edinburgh where I was again targeted as the person who would unhappily pay the extra cost of checking a bag, rather than carrying it and placing it into the overhead bin myself. 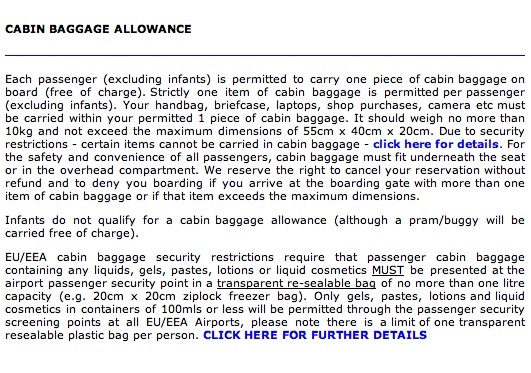 Now, I have no real problem with being told that I can only fly with restricted luggage. I have become expert at wearing most of my clothes, carrying no make-up, minimal extra gear, and I can usually get most of what I need for travelling into a rucksack. What I have a problem with is that the goalposts are constantly changing according to which airline you use. My bag did not actually fit into the cabin baggage measuring device at Cardiff airport which BMI Baby provided, but it did fit into the device provided by a competing airline right next to it. It was minimally too big for Baby by only a few centimetres, but would definitely have fitted into the overhead bin. I know this for sure, as some other passengers who travelled on the flight and who had their bags on board, managed to fit their much larger bags into the bin. The problem I really had with BMI Baby, apart from their rude staff, is that even though each airline issues passengers with dimensions and weight restrictions for on board baggage, these rules were not then pursued properly or fairly. Everyone who had two pieces of baggage should have been made to check one of those. They were not. I believe it is a sensible arrangement as it cuts down on the amount of time that it takes to load the plane, which is important when you are running a cheaper service. 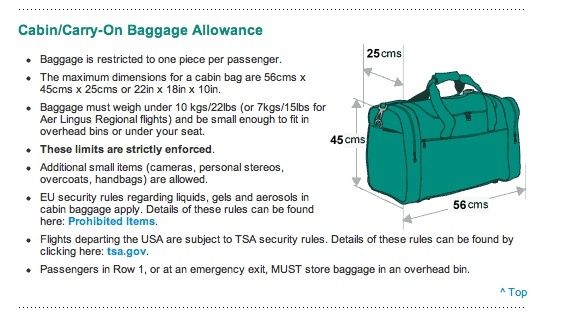 (Don’t let me start on the fuss and nonsense some people are guilty of when getting on and off planes ……) But if passengers had bags which were bigger than the allowance – either in weight or size – then the bag police should have dealt with them all fairly, which on this particular occasion they did not. 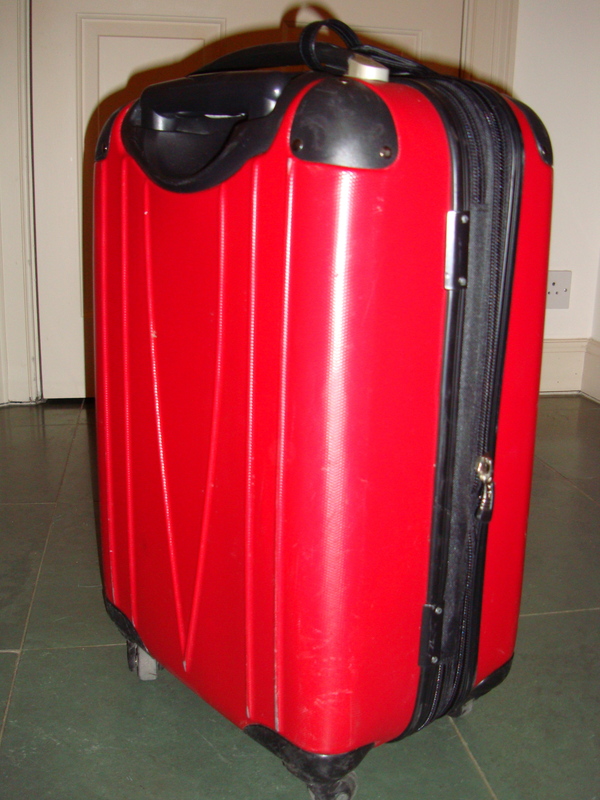 It may be useful to know what the airlines say…..
My little bag shown above measures 53cm by 33cm by 23cm and so it seems that it is marginally too big for either Ryanair or BMI Baby and will probably need to be retired or simply consigned to its own luxury in the hold, but you see I have flown on a Ryanair flight at least 80 times previously – with the same bag…. Previous What do you know?